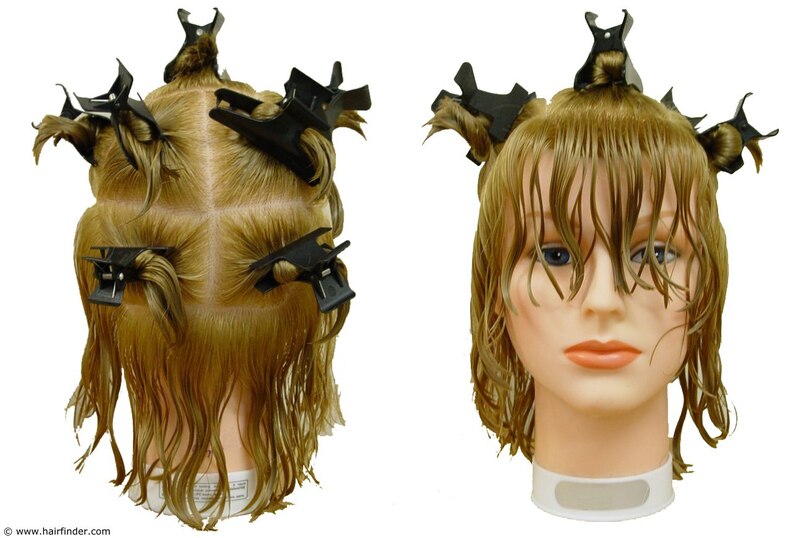 There’s a standard technique for sectioning the hair in preparation for haircutting taught by cosmetology courses as part of the state licensing board’s requirements for cosmetologists. This is referred to as a 7-Section parting. The scalp is divided into seven sections: top, right side, left side, right crown, left crown, right nape and left nape. In addition a one-half inch band of hair is left to hang loose around the perimeter of the hair line. Above are some photos which show exactly what is intended. Sectioning the hair in this way allows you to cut the hair in a controlled manner. You typically work from back to front and from the bottom up in most cases (specifically when you are creating shorter, layered hairstyles). When creating truly long hairstyles, you may re-confine the sections of the hair after cutting them in order to prevent the hair already cut from interfering with the uncut hair. This is especially useful with clients who have very curly hair. You start by making a clean parting line from the point just behind the ears on one side to the matching point on the opposing side. Next, make parting lines on each side of the head just along the parietal ridge to isolate the hair at the top of the head. Comb the hair smooth toward the center of the section at the top of the head and twist it up into a knot and clip with a butterfly clip to secure it. Do the same on the right and left sides of the head. Now, create a parting line down the center of the back of the head. Isolate the Right and Left Crown sections by parting the hair in a line from behind the ears to the center parting just created. These horizontal partings should meet to form a straight horizontal line across the back of the head. Comb to smooth these sections and twist and secure them as with the previous sections. The remaining two sections – the Left and Right Nape – are easily secured into separate twists. After the sections are secured, go back over the head, section by section, and let down a one-half inch strip along the outer edge of the hair – the perimeter, or hairline – and re-twist and secure the hair sections. Your finished 7-Section parting (seven section parting) should resemble the photos shown above.